Across the country, over 680 confirmed arrests by Immigration and Customs Enforcement (ICE) occurred within one week in at least 11 different states. With these sudden arrests, many fear new, aggressive policies and an increased normalization of raids and separation of families. Conflicting reports from the federal government, ICE authorities and media outlets have only contributed to harmful fear and uncertainty among immigrant communities and their loved ones. There has been a severe lack of transparency. ICE has been acting in the shadows, only talking to the media to insist the recent arrests follow its standard procedures, claiming anyone suggesting policy changes is provoking unnecessary danger for both immigrants and officers. Yet President Donald Trump has brashly heralded these terrible events as an example of his campaign promises to crack down on immigration. Meanwhile, immigrants, families and advocacy groups have been left with little to no clarity about actual policy and no path to move forward. We can confirm that the Department of Homeland Security, under Trump, has expanded the definition of whom it intends to deport. While the Obama administration did deport undocumented immigrants and residents with felonies, Trump’s Jan. 25 order now targets residents and undocumented immigrants with any form of criminal record — under a false claim of protecting national security. In the wake of these fear-inducing ICE raids, we must respond with tactical resistance, education and, most importantly, compassion and solidarity by resisting policies of hate. Our country cannot fall for this false narrative of criminalizing immigrants. No one is made safe by upturning the lives of countless immigrants, many of whom have been in this country for years and present a benefit, not a threat, to their local communities. People should not fear deportation because they had a traffic violation or case of social security fraud over eight years ago. The ICE raids are tearing apart families of mixed documentation status, upturning the lives of people who have been living in the country for years and forcing people to live their lives in hiding simply because of their documentation status. The xenophobic rhetoric infecting American politics should be alarming for anyone concerned for civil rights, human decency and the well-being of the U.S. as a whole. Beyond the horrendous civil rights violations, undocumented immigrants make up 10 percent of our workforce and contribute $130 billion to the state’s gross revenue. Across the country, undocumented immigrants pay $12 billion in taxes. Amid these ICE arrests we must not create unneeded fear and anxiety for immigrants and their loved ones. We must perpetuate truth rather than fear mongering. With so little clarity, our focus as a society must be to keep people calm and informed. The only way to combat chaos and fear is with knowledge and solidarity. There needs to be a focus on educating immigrants of their rights. 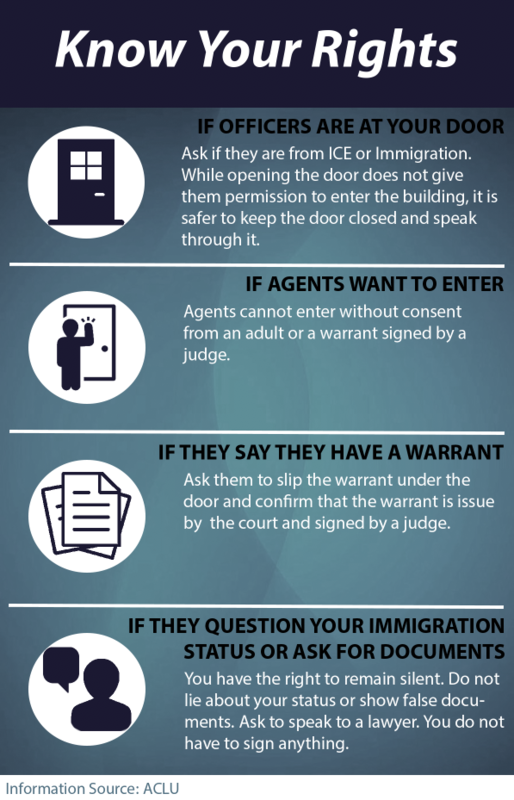 Regardless of documentation status, everyone has the right to remain silent, the right to counsel and the right to deny to an unwarranted search by immigration officials. It is essential that local governments, attorneys and anyone in a position of power do their part to join immigration advocacy groups like National Immigration Project and the Immigration Defense Project to spread this information throughout immigrant communities. Rather than spreading unwarranted fear, there needs to be a collective effort across all communities to make sure immigrants and their families have access to the knowledge necessary to protect their rights. It’s crucial that we act as watchdogs in our own communities and ensure immigrants, their families and advocacy groups have the time to be prepared and respond. Free online services like PaseLaVoz help keep track of local ICE raids and checkpoints based on the information users share. This aids in pulling immigration officials out of the shadows and enforcing accountability. We must also hold local governments accountable to ignore the threats of losing federal funds and prioritize the safety and protections of immigrant community members. While many cities like Santa Cruz have long claimed sanctuary status, meaning they will not voluntarily provide information to immigration officials, we need to pair action with that title. We need to ensure that undocumented immigrants in our community actually feel protected and secure. As the Trump administration tries to pressure cities and state governments to cave in to his anti-immigrant policies, we must make certain our communities strengthen their resistance and help our neighbors as much as possible. Regardless of the circumstances of these ICE raids, they are un-American, unwarranted and irresponsible. We should be creating a path to citizenship, ensuring security of families with mixed documentation status and helping to ease uncertainty.